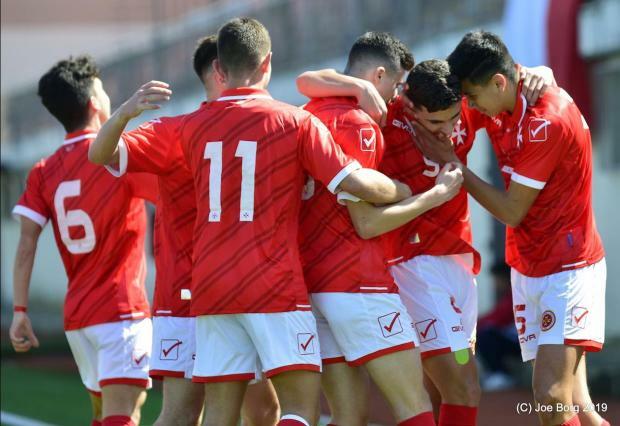 The Malta U-16's team enjoyed a bright start to the UEFA Youth Boys Development Tournament after beating Albania 2-0 in their opening match at the Centenary Stadium on Monday. Andrea Zammit’s well-taken brace rewarded Malta’s lively second-half performance and resilient effort. The game was generally balanced with Albania seeing more of the ball in the opening half but Malta, led by coach Noel Turner, created some good opportunities on the counter. Ten minutes into the game, Kurt Briffa made a timely run into the Albania box from the left but his effort lacked the power to trouble the Albanian goalkeeper. Four minutes later, Miguel Spiteri, the Malta U-16's goalkeeper, was prominent with a fine save to push away Klajdi Lusha’s dangerous shot from just outside the box. Azriel Borg then embarked on a solo run through the middle but his drive was blocked by Qenan Bokova, the Albania goalkeeper. The visiting team tried to up the pressure in the late stages of the first half but were kept at bay by the Maltese players with Spiteri solid in goal. Two minutes before the break, Zammit went close with a rising effort which sailed over the bar. The Maltese youngsters raised their game in the second half, taking the lead on 51 minutes. A flowing move saw Nathan Agius advance before directing a through-ball to Zammit who shrugged off his marker and scored with a clinical finish. This goal lifted the morale of the Maltese team while Albania sought to get more players forward in search of an equaliser. Albania went close on 62 minutes when captain Mario Mitaj’s diagonal effort was touched on to the post by Spiteri. The Maltese team took advantage and struck the decisive goal 12 minutes from time when Zammit profited from a miscued backheader by an Albanian defender and lobbed the ball over the on-rushing goalkeeper. The Malta U-16's meet Denmark in their second game on Wednesday at the Centenary Stadium (kick-off 15.00). Denmark beat Scotland 4-0 in today’s second match. Miguel Spiteri (78 Daniel Grima), Isaac Cutajar, James Vella, Nathan Agius, Antheos Spiteri (41 Brite Ihuomah), Andrea Zammit (78 Glending Farrugia), Kurt Briffa (78 Zachary Chetcuti), Nathan Sultana (65 Matteo Gambin), Sebastian Cassar Torregiani (41 Zean Leonardi), Azriel Borg (65 Jake Grech), Nikolai Micallef (65 Owen Sammut).